Vladimir Lenin’s piercing stare while in a wheelchair, 1923. 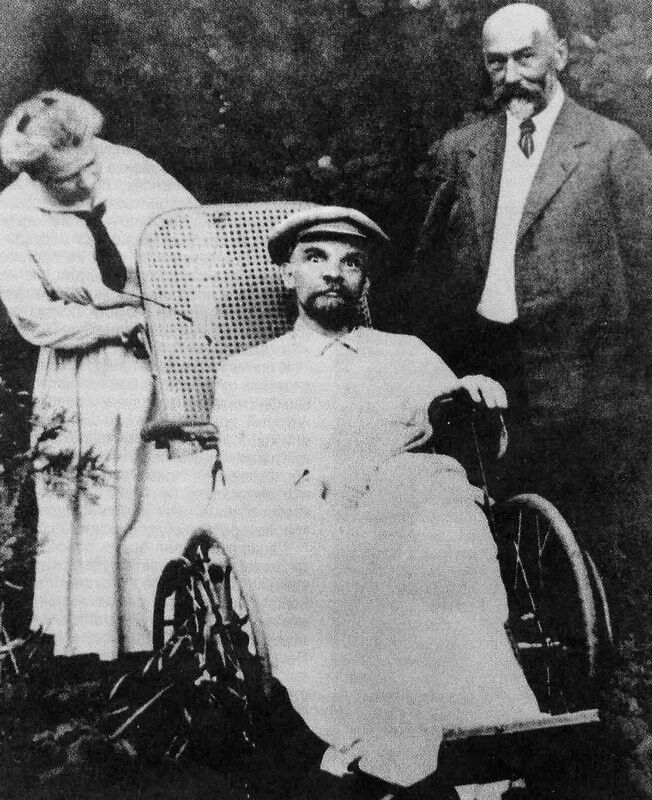 This last photo shows Vladimir Lenin in a wheelchair after suffering three stokes in the previous two years. By the end he was paralyzed and completely mute. Beside him are his sister Anna Ilyinichna Yelizarova-Ulyanova and one of his doctors A. M. Kozhevnikov. The mental strains of leading a revolution, governing, and fighting a civil war aggravated the physical debilitation consequent to the wounds from the attempted assassinations. In 1918, Lenin narrowly survived an assassination attempt, but was severely wounded. His long term health was heavily affected. In March 1922 physicians prescribed rest for his fatigue and headaches. Upon returning to Petrograd (Saint Petersburg) in May 1922, Lenin suffered the first of three strokes, which left him unable to speak for weeks, and severely hampered motion in his right side. By June, he had substantially recovered; by August he resumed limited duties, delivering three long speeches in November. In December 1922, he suffered the second stroke that partly paralyzed his right side, he then withdrew from active politics. On March 10, 1923, Lenin’s health was dealt another severe blow when he suffered the third stroke, this one taking away his ability to speak and concluding his political work. Lenin was mute and bed-ridden until his death but officially remained the leader of the Communist Party. Vladimir Lenin died at 18:50, Moscow time, on 21 January 1924, aged 53, at his estate at Gorki settlement (later renamed Gorki Leninskiye). In the four days that the Bolshevik Leader Vladimir Ilyich Lenin lay in state, more than 900,000 mourners viewed his body in the Hall of Columns. Despite the official diagnosis of death from stroke consequences, persistent stories mark syphilis caught from a Parisian prostitute as the cause of Lenin’s death. A “retrospective diagnosis” published in The European Journal of Neurology in 2004 strengthens these suspicions. Helen Rappaport, an acclaimed historian and author, said that Lenin showed many symptoms of syphilis and that many among the Soviet hierarchy believed he had it. But they were banned from speaking in public and threatened with death because of the embarrassment it would cause. Central to Rappaport’s case was a report written by the celebrated scientist Ivan Pavlov – famous for his Pavlov’s Dog theory – which claimed that the “revolution was made by a madman with syphilis of the brain”. In his declining years, Lenin worried about the bureaucratization of the regime and also expressed concern over the increasing power of his eventual successor Joseph Stalin. Increasingly, he saw a party and government that had strayed far from its revolutionary goals. In early 1923 he issued what came to be called as his Testament, in which a regretful Lenin expressed remorse over the dictatorial power that dominated Soviet government. He was particularly disappointed with Joseph Stalin, the general secretary of the Communist Party, who had begun to amass great power. Why stroke victims can’t speak? That happens because one of the parts of the brain responsible for speech have been destroyed due to necrosis following blood loss or trauma during the stroke. There are parts of the brain responsible for comprehending speech, and the actual act of speaking. So a stroke victim may literally be unable to formulate a word even though he/she would have no problem saying it; and there are those who know exactly what they want to say but can’t say it. In 1918, Lenin narrowly survived an assassination attempt, the first bullet struck his arm, the second bullet his jaw and neck. He retained the bullet in his neck, until a German surgeon removed it on 24 April 1922. In a testament to his standing in Russian society, his corpse was embalmed and placed in a mausoleum on Moscow’s Red Square. Lenin’s mummified body has been on display there ever since, except for a four-year period during World War II when it was moved to Siberia. I don't wanna think what would have been of the Soviet Union had he lived 10 or 20 more years but for sure some 30 million Russians would have been alive for many more years. Iosif Vissarionovich Dzhugashvili proved to become their ruthless executioner. In my life I have seen this photo only once before this post. In a newspaper or in a magazine several years back. It was said that this photo was not made public before several decades as the post-Lenin Soviet rulers wanted to prevent people from seeing the deplorable degradation of Lenin's condition in his last years of life. Very similar to photos of Charlie Manson. Crazy killer eyes. Given the wheelchair, paralysis, and that blanket, I'd guess that the all knowing, all powerful, leader of world revolution was peeing himself and wearing a diaper. Lenin... a complete crazy. He suffered exactly what he deserved, albeit way, way too late for his People. Lennin was mild compared to Stalin. A USSR under Lennin would have greatly changed the direction of WW2 and thereafter. “revolution was made by a madman with syphilis of the brain"